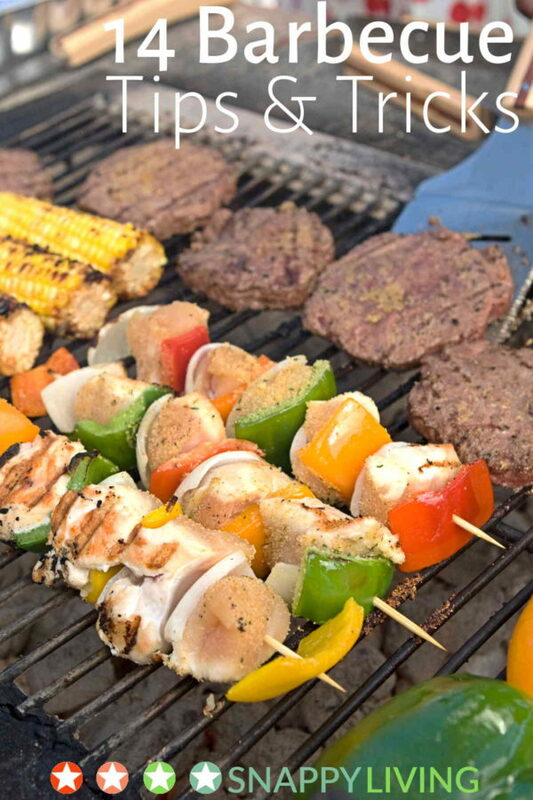 Backyard barbecues are tremendous fun, but everyone always remembers the food later. People are picky about barbecue, especially in regions where most everyone barbecues and takes pride in doing it well. Here’s a collection of barbecue tips to help you make your cookouts memorable. I can’t give you the perfect barbecue sauce or marinade or rub recipe, because there are many great ones and it’s a matter of personal taste. Nor am I going to divulge some big secret that’ll make the meat cook just right every time. These barbecue tips are about getting you to think about your grilling the way people who grew up eating barbecue regularly think about it (and yes, I am one of those people). Keep it simple. Barbecue is not gourmet food, so you really don’t need a special herbal rub or fancy marinade. Barbecue is about taking a quality piece of meat and cooking it over an open fire. If you do want to season it, you don’t need exotic herbs that sound impressive. Salt and pepper add more flavor than you think. Pick the right beef. Beef is prized according to fat content because fat means flavor. Meat really needs to cook in with the flavor only fat can provide. You can trim the bigger chunks of fat off after you’re done cooking. But if someone is looking for low-fat meat at a barbecue, point them to the chicken. Kobe is the fattiest beef, followed by Angus, followed by Prime cuts, choice cuts, etc. Organic beef also typically has a higher fat content. Grassfed beef is the healthiest choice, because it has more omega-3 oils than feedlot beef, even organic feedlot beef. Cuts from the back end of the cow – ribs, rumps, loins – are more tender than those from the front. Look for good marbling in your beef. Pick the right chicken. The best-tasting chickens are raised organically with plenty of room to wander around. Go to a local farmer’s market, or at least buy organic or free-range. For a barbecue, buy it with the bones in, as they will help the heat radiate through and cook it more evenly. The chicken can be pulled off the bone later, if you prefer. While most any part of a chicken barbecues nicely, dark meat cuts retain more flavor and juiciness. Pick the right pork. As with beef, go for cuts from the back end of the pig, which are fattier. Cook them with the fat in and trim it off later if preferred. Tenderize the meat. One of my beset barbecue tips. Not everyone does this, but tenderizing your meat with a tenderizing hammer will make it cook more evenly and stay more tender. Always cook on a clean grill. Not everyone realizes how important this is. I’ve got some tips on how to clean a grill and keep it clean as you go. Pre-heat your grill. It takes 15 to 45 minutes after lighting the coals for a grill to become hot enough to cook your meat. (Your grill manual may give you specifics for it.) Leave yourself enough time to let the grill get hot before you put the meat on. Heat, not flames. Some people think you need big flames to cook meat, but flames just give meat a weird, almost sweet, charred flavor. Flames should never touch your meat. Don’t overdo it on lighter fluid. Use just enough to get a nice fire going. And never add lighter fluid after you’ve already tried to light the coals – that’s dangerous. If you want more flame, use tongs to move the coals around gently. That stirs the oxygen, which fuels the fire. Keep a mister of water on hand for flames. If you accidentally get big flames going, spray water from a plant mister over the coals. That will dampen them down without losing the fire. Cook your meat the right length of time. BBQ Recipe Secrets has a great list of meats and their cook times. And the New York health department has some great safety guidelines. If you’re concerned about being able to tell how done the meat is, use a meat thermometer. And remember to remove the meat a minute or so before it’s as done as you want. The heat will keep cooking it for a little bit after you’ve removed it from the grill. Aromatic woods don’t taste great to everybody. Sprinkling chips of exotic wood might sound great, but some woods add strange flavors to meat. Hickory is generally safe – it’s a very popular wood in the South, so most Southerners are used to the flavor. But charcoal is your safest bet. Adding the barbecue sauce. There are two ways to add barbecue sauce to meat. First, you can give the sauce to your diners and let them add it themselves, after cooking. Second, you can baste it onto the meat while you’re cooking it if you’re sure everyone will love the sauce. What you absolutely do not want to do is serve meat dripping with sauce to your guests – even if you’re serving the meat “pulled.” That’s a stew, not a barbecue. Finding the perfect sauce. Like I said above, there are a lot of perfect sauces, and preferences vary by region and personal taste. The perfect sauce is whatever you like. Some people wouldn’t dream of using store-bought sauce, but many serious barbecue artists do. There are loads of fantastic sauces you can order online – they often come from restaurants or specialty chefs. If you want to make your own sauce, look at recipes online. “Genuine” barbecue sauces cover quite a range of flavors: equally sweet/hot/smoky, heavy on vinegar and tomato (almost like a Buffalo sauce), heavy on yellow mustard, etc. I hope these barbecue tips help you make everything from your family grilling to your outdoor summer parties wonderful.